When parents divorce and a child’s family is split up, the repercussions are far wider than just that family. While, yes, that family bears the brunt of the impact, the ripple effect throughout friends of the family is real. And that includes friends of the children of the family. For the youngest of those friends, divorce can be particularly confusing. The details and reasons for a divorce are obviously private, so helping your child to understand what is happening to their friend’s family can feel like a challenge. What is happening to this family – and the consequences, like moving or vastly different dynamics – have nothing to do with your child, even though they may affect your child. Thing is, details of why the divorce is happening is irrelevant to helping your child understand the general situation and what you can all do to help the friend and the friend’s family in this time of sad upheaval. For a child whose parents are divorcing, some level of acting out or expressing themselves emotionally is somewhat expected. 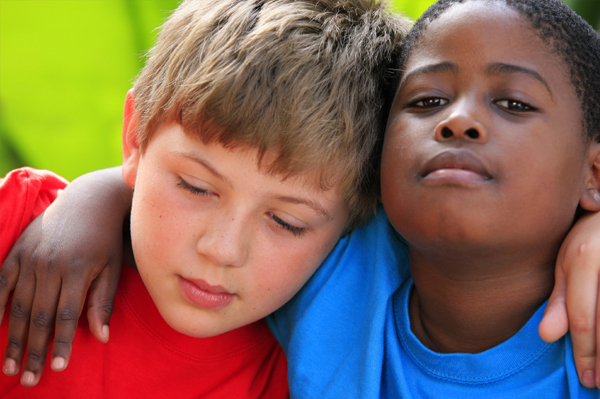 For the friend of that child (your child) whose understanding of the world is still developing, it may be hard to understand what their friend is experiencing – and an appropriate way to express needed empathy. A child may not be able to grasp exactly why the friend is so moody and out-of sorts; they want the friend to be the same friend they’ve always been, and may in turn act out emotionally when they are not. While this can be a good time to start talking about the way friends support one another (an excellent life skill!) and empathy and remind your child that they aren’t the only ones that matter, it may be more appropriate to keep it simpler than that. You can be matter-of-fact about it, telling your child that Janie is feeling anxious about changes at home, so your child can be a stable constant for her at times, even if Janie’s mood is a little unpredictable. Sometimes the impact of divorce is a friend moving away. Especially if it is a close friend, this can feel like a personal afront! But it’s not. It’s unfair, sure, but it’s not personal. Helping a child understand the difference and manage the subsequent feeling is hard! As a parent, it’s heart-wrenching to watch your child lose a friend whether to the demise of the actual friendship or phsycial separation. If it’s the latter, and the reason is a friend’s parent’s divorce, at least you can facilitate communication and hopefully some level of continuity for the friend in the middle of it. Between email, letters, pictures and even visits, relationships can continue. And that continuity will likely help both the kids through the transition. Explaining to your child, in the simplest possible age-appropriate terms about divorce and what it means, may be something you never thought you’d have to do, but it happens. If and when it happens in your child’s life, these conversations are a good start to helping your child understand what is happening. Additional discussions about ways to express empathy and appropriate ways to support friends going through upheaval are needed, too. All of it can help your child understand that he or she – and probably the friend – will be okay, and they can still be friends.